But six months ahead of an October election, polls suggest the 47-year-old politician with the broad smile and a penchant for colorful socks could become the first prime minister to lose power after a single majority mandate since the 1930s. "The Liberals have taken a hit, but they're still competitive," said pollster Nik Nanos. "The most significant effect has been the negative impact on the prime minister's personal brand." An Ipsos poll from last month put the Conservatives at 40 percent, 10 points ahead of the Liberals. Trudeau, the oldest son of the late Prime Minister Pierre Trudeau, has from the start pushed a progressive agenda in support of gender equality, the environment and aboriginal rights, all issues that appeal to his core voters, but which after more than three years sound increasingly scripted to some. Trudeau is not helped by the optics of the scandal involving SNC-Lavalin Group Inc, a prominent Montreal-based engineering and construction firm that has been accused of bribing Libyan officials to get contracts between 2001 and 2011. The prime minister has been on the defensive over allegations government officials inappropriately pressured Canada's former Justice Minister Jody Wilson-Raybould to drop a criminal case against the company in favor of a deferred prosecution agreement, or out-of-court settlement. Wilson-Raybould, the first indigenous justice minister in Canadian history, resigned over the scandal. Former Treasury Board chief Jane Philpott also quit in protest. They were two of the highest-profile women in Trudeau's Cabinet. So far, Trudeau's strategy appears to have changed little, and people close to him say he plans ride it out without major shifts in strategy. "Successful politicians know when to pivot, and they have a strong survival instinct," Nanos said, calling the scandal the "first major test of Justin Trudeau's leadership". 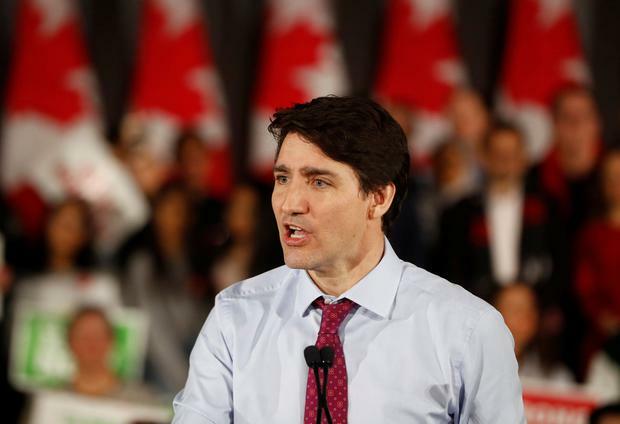 Ipsos pollster Darrell Bricker said even before the crisis erupted in early February, Trudeau's support had been softening amid complaints he had broken major commitments such as reforming the voting system and balancing the budget by 2019. "Justin Trudeau was standing on thin ice at the end of last year, and then somebody handed him an anvil and crash, the ice broke," Bricker said. "There's a credibility problem driven by a bunch of things, one of which is promises made and not kept." In a bid to finally put the scandal behind him, Trudeau expelled Wilson-Raybould and Philpott from the Liberal caucus last week. Neither minister has gone quietly, and on Tuesday Philpott disputed the legitimacy of the expulsions. On Sunday, Conservative Party leader Andrew Scheer revealed that Trudeau had threatened to sue him for libel over a Facebook post about the scandal. Ryan Wilkinson ONE of the divers who helped save the Thai cave schoolboys became the focus of a similar rescue mission - but only wanted pizza when he was retrieved after 28 hours trapped underground. Catherine Lucey, Associated Press WHITE House senior adviser Ivanka Trump said her father asked her if she was interested in taking the job of World Bank chief but she passed on it.